Two years ago, my brother's fantasy hoops league began its annual steak dinner tradition. Each season, the league votes on which steakhouse to clog our arteries at. Two years ago it was Del Frisco's. Last year we hit Keens. This year we went for the granddaddy of steakhouses: Peter Luger in Williamsburg. It was my second time at this establishment (see photo, which I grabbed from Yelp). Peter Luger is considered by many to be home to the best steak in the city. 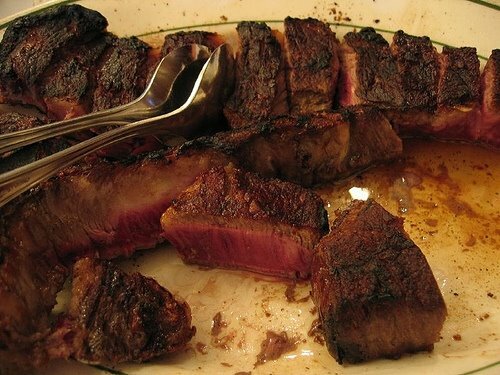 I haven't been to all the major steakhouses in the city, but I already know of at least two steaks that I think are far better than Peter Luger's porterhouse. They're Old Homestead's porterhouse for two and Spark's sirloin cut. That said, Peter Luger's is still good, but not great. My steak, however, tasted better tonight because it was free. The top three finishers in our league get free steak dinners and the bottom three finishers have to pay for them. At third place, I just made the cut. Seriously, no pun intended. Even though Peter Luger's is not my favorite, I will be very happy if I find myself there again at the end of 2009. A buddy of mine told me he was trying to lose 50lbs in one year. I told him if he did, I'd buy him a steak at Peter Luger, his steakhouse of choice. It's a tough challenge, so he would deserve every bite of that artery-clogging bliss.